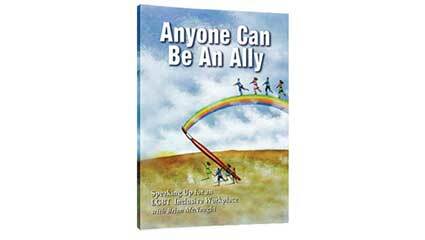 In this comprehensive training program, Brian McNaught demonstrates how anyone can be an “ally” in helping to create a respectful workplace that is inclusive of gay, lesbian, bisexual and transgender co-workers. Help your employees and managers build bridges of mutual respect and give them the skills to become allies who speak up on behalf of others. When gay, lesbian, bisexual and transgender people don’t feel safe and valued at work, their productivity goes down, and the organization may fail in their efforts to attract and retain the best and brightest talent. Many organizations realize this, and have created clear policies on the issues. But in order for the climate to change, gay, lesbian, bisexual, and transgender people need “allies” to speak up. In this comprehensive training program, diversity consultant Brian McNaught demonstrates how anyone can be an ally to create a respectful workplace that is inclusive of gay, lesbian, bisexual and transgender co-workers. While the intent of the training is to put a face on the issues confronting LGBT workers, it is not about changing the beliefs of others – it’s about changing behaviors and creating a respectful environment for everyone in the organization. Real people from both sides of the issues tell their stories and points of view. Gay men, lesbians, a bisexual and a transgender person each share their experiences as related to the fears and treatment they face in the workplace. Countered with them are people with religious and social convictions who have their own point of view. Through these stories and experiences, Brian shows how the viewer can learn to become an ally (or just a more welcoming co-worker) to those of a different persuasion. Main Video: written and hosted by Brian. FAQ: Brian answers the questions he’s asked the most in his presentations. Tom’s Story: This is a personal story that Brian tells at all his workshops. It’s about creating a workplace that’s welcoming for a closeted gay co-worker to come out. This can put a face on the issue. Guided Imagery: Brian takes viewers on a journey to learn what it would be like to be straight in a gay world. This exercise can help open people up to look at the issue from a new angle. Interview with Brian: This conversation is intended for the facilitator. Brian shares more about the challenges of doing this work, and how best to use this program. The support material for the facilitator is designed for flexible use. It offers a lesson plan and prompts for the facilitator to conduct a discussion-oriented training session, as well as optional modules that use the Extra Features to expand and deepen the session. Brian McNaught is considered the world’s leading corporate diversity consultant dealing with LGBT issues in the workplace. Brian has led workshops and training sessions for organizations including, AT&T, Merck, Citigroup, Bank of America, Hewlett-Packard, DuPont, the NSA, and many other corporations, government agencies, and hundreds of colleges and universities.